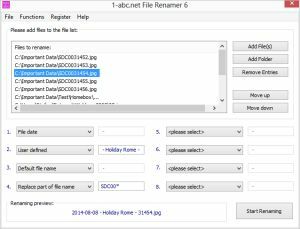 1-abc.net File Renamer - Give your files the right names in batch mode! Give your files the right names in batch mode! Even if there is much more additional file information besides a file name that is saved with a file nowadays, file names are still the most important attribute for users when they search and hopefully find the data they are looking for. Anyway, there are many file names that are determined automatically and most users never change it later. Pictures you made with your digital camera for example very often have file names like “IMG_1329” instead of “IMG_1329 - Christmas in New York with my wife” or media data like a video you download from the web is called “003245.mpg” instead of “Funny animal video 0005 created on 2007-11-08.mpg”. And if your MP3 stick is not able to sort files from their creation date but the file name you wish that you could just add the file date to the name without changing anything else. The main reason why file names are not changed later very often is that it is very time consuming and boring if this concerns more than just 3 or 4 files. Finally, files are kept with such senseless names until the day where you do not find again what you are looking for. 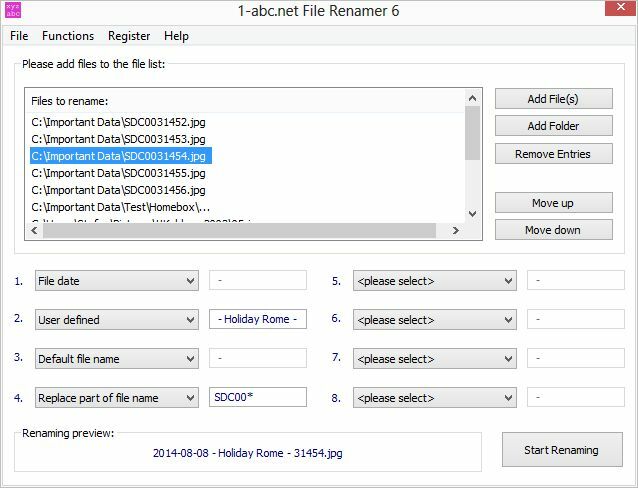 1-abc.net File Renamer will let you see that such renaming tasks can be much easier or even fun. Just add as many files as you want to a file list, then change the file positions if required and define how file names should look like. You can decide by your own if the new file names include today’s date and time, file creation date and time, numbers, the original file name, customized text, single expressions exchanging or what ever you think. A preview feature allows you to see the final file names as they will be after renaming, and if you are satisfied with this, it’s just one click to change all these names automatically!